Having been ruled by Nandas, Mauryas , Satavahana, Chutus, Kadambas, Chalukyas, Rashtrakutas, Seunas, Vijayanagar rulers, the Bahmanis, the Adil Shahis and the Marathas, you will find ample reminders of the history gone by. Famous among the luminaries who left indelible mark here, are the kittur Rani Channamma, Sangoli Rayanna etc. Belgaum is not a stranger to history, but this site Navilthirtha is one of the earliest and most important discovery. 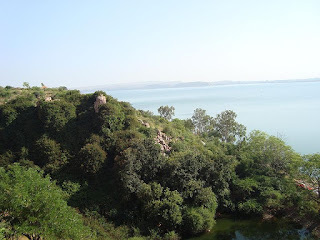 This site Megalithic links karnata to Indus valley literally. Karnataka is not a stranger to Megalithic sites. So many Megalithic sites have been found, in fact the largest number of megalithic sites in India are found in Karnataka. Navilthirtha (peacock gorge) is a deep gorge cut by the Malaprabha river in a roughly east-west oriented hill range of sedimentary rocks. It is located about 6km northwest of saundatti in Belgaum district. In 1950, while exploring for stone Age sites in the valley, R.V. Joshi(sankalia, Subbarao and Joshi 1951:82) discovered a megalithic site on the northern site of the gorge, stated to be in manoli, but within the revenue limits of sindhogi, The monuments were discovered were called as Dolmenoid cists. Mr. Joshi also discovered five early palaeolithic sites located north and south of the gorge at Katral, Hadagali, Manoli, Teggihal and Hirur. In the 1965-68 explorations of this area Sundara. A discovered two more sites, one at Tallur(about 15km northwest of Sindhogi), and the other about 10km south of Sindhogi at Saundatti (Sundara 1975:24-25). At Tallur a habitattion site was found near a megalithic burial site, with black and red, bright read and dull red pottery of types associated with megalithic structures. Russet coated, white painted pottery of the early historic period was also found. From a distributed round barrow nearby were recovered 21 conch shells, each with a pierced hole indicating that they were worn strung together, plus pottery, pieces of iron and human skeletal remains. The Megalithic monuments in these sites are of three types: passage chambers of konnur tyupe, passage chambers of kaladgi type and round barrows. In 1974 , when the construction of the dam across the Navilthirtha gorge was in the early stages. A. Sundara picked up a small polished Neolithic Axe nearby, Earlier he had discovered additional Neolithic sites further down the Malaprabha valley. The Engraving comprises two similar convolutions which have been interfaced together. Each Comprises a single line of engraving, with two peripheral loops and one inner one. The resulting symmetrical pattern thus comprises two rows each of three loops within the outer curved borders, and this gives the illusion that only one line has been engraved. The pattern has clearly been carefully conceived. The total area of the pattern is 90 by 65cm approximately and the lines , while originally deep and thick, have been weathered in places. It is possible that they were made with metal tools. In addition, within and outside the design there are a number of small impressions or cup marks about one centimeter deep. The main design would perhaps remind a scholar of medieval stone sculpture, especially in coastal Karnataka of symmetrical Naga mandalas. The Proximity of other megalithic sites , the technique of engraving, the design on the stone, and the absence of similar engravings outside the area of megalithic sites in the Hire-Benkal region, all suggest that this engraving is to be associated with a megalithic culture. Most Interesting but most distant parallel for the design occurs on a flat copper tablet from room 30, house I , V5 area at Mohenjodaro(Marshall 1931 :400 and plate CXVIII,5) This tablet approximately 2.3cm square, has an engraved design on one face and a one line inscription of four Harappan characters on the other. The engraved design on this object is of only one line, and it forms four loops, instead of the six at Navilthirtha. However , it is proved by experimental drawing that it is possible to produce such six loop design using only one line , two are necessary. Nevertheless ,both the Mohenjodaro and the Navilthirtha designs are strikingly similar, and further study of possible relationships would be desirable despite the differences in time and space between the two sites. 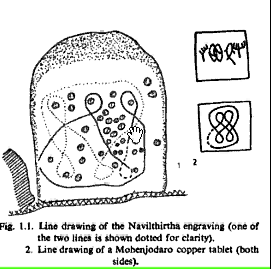 The Navilthirtha engraving is therefore of considerable importance, and the only one of its kind in a megalithic context in India. It may provide an ultimate proof to relationship between the builders of the passage chambers of Karnataka and Harappan Civilization. 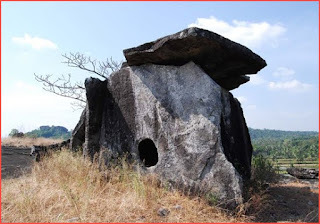 Source A Newly Discovered Megalithic Carving in Karnataka by A. Sundara in Recent Advances in Indo-Pacific prehistory. A very interesting article. I would like to visit this megalithic monument. Do you know the exact location? Google Map coordinates would be very useful. It is in Savadatti (Saundatti) near Naviltheetha Dam.